Hello Everyone! We had a great time last week with our daughter, who was home for spring break. This was her last one, because she graduates in May, yippee! We spent the first day catching up at home, then we were off for a few local trips. On Monday, we took a trip to Red Top Mountain State Park in Cartersville, GA to do a little hiking and have a picnic lunch. It was supposed to warm up that day, but that didn’t happen until late in the afternoon. We did hike on the nature trail close to the Visitor’s Center because as you can see above, Lake Allatoona was flooded. Almost every trail in the park had some kind of flooding on them which made them impassable. The lake and park were very quiet that day. We did picnic in the cold, but it was a quick lunch. Fortunately, Tuesday was a much nicer day. We spent the day in the Dahlonega, GA area. Our first stop was Cane Creek Falls just outside of Dahlonega. We chose that one because there wasn’t a hike to see it. The falls are located on the grounds of Camp Glisson and are only accessible when the camp is not is session. As you saw from the flooded Lake Allatoona, we’ve had lots of rain so the falls did not disappoint. There was lots of water flowing over the falls and you could see where the creek had risen on the sides of the bank. I love a good waterfall! The day was beautiful. We did a little shopping in Dahlonega and had lunch, then headed out to one of the many wineries in the area. We chose Frogtown Cellars for our vineyard visit and tasting. The place was beautiful and the wines were really good, too. After the tasting, my husband and I had a glass of wine while we enjoyed this lovely view from the deck. I need to find a place to camp nearby so we can spend a few days touring the other wineries in the area. I definitely want to go back to Frogtown again, too, when the grapes are on the vines. On Wednesday, my daughter and I had a mother/daughter day out with shopping and lunch with friends. Then it was back to Pensacola for her. We had a great time and as always, it was quiet when she left. Needless to say, I didn’t get much quilting done last week while she was home, but I did find some time for cross-stitching. I did get some sewing time in this weekend and I’ll be back soon with progress updates on a few things. Until then, have a great week and thanks for stopping by. Hello Everyone! I wanted to let you know that Jacquelynne Steves has opened The Art of Home Club for new member sign ups. The sign up closes on Friday, March 15. I’m sorry for the late notice, but I’ve been out of touch this week because my daughter has been home for Spring Break and we’ve been out and about every day. You can read all about the club and sign up here. The club is so much more than just getting a few great patterns every month. You also get free tutorials and videos for techniques such as applique, embroidery, and fabric painting. There are bonus mystery sew a longs apart from the monthly collections and members receive bonus blocks for Jacquelynne’s Free BOM. There is also a private members only Facebook group. Projects range from lap size quilts to small embroidery pieces and everything in between. For example, the cabin collection has a lap size quilt, pillow and a small wall hanging in it. Jacquelynne has great tips to mix and match pieces from different collections, too. Please take the time to check out the club details here. I’ll be back soon with a few pictures from our week. Thanks for stopping by. Hello Everyone! After the busyness of the past two weeks (pattern writing and getting the Cabin Collection finished), I decided to slow down just a speck this week. I got caught up with my quilt journal (see post here about that), did some other admin tasks (taxes), enjoyed pulling fabric for the Sew Your Stash Along (SYSA) and started a new cross-stitch project. First though, I got back to the Round & Round Table Runner. The mini pattern is for one 11″ Round & Round block, but I decided to make three for a table runner. I had sewn a few pieces together in each of the blocks, then set it aside to work on the cabin quilt. When I came back to it, I thought it would be easiest to sew one block at a time instead of trying to keep all those pieces organized while chain piecing. I made the one on the left first and followed the pattern instructions for sewing each row together, then sewing the rows together. Mostly the seams and points all match, but it’s not quite as straight as the second one. In the second and third blocks, I sewed groups together. For example, in the second and third rows, I sewed pieces together in thirds, then sewed top to bottom. Then I was able to sew the two row units side to side. By sewing the pieces together as units gave me the opportunity to square them up as I went, which meant a neater and more accurate finish. I will be using the table runner as my Minis and More Parade project this month. Sherri’s and Michele’s theme is anything spring. The fabrics are Moda Grunge and Lella Boutique’s Garden Variety by Moda. Also this week, I started on Step 3 of the SYSA by Diane Knott of Butterfly Quilting. My guild is using this as a special project for the year. I always have fun selecting the fabrics, one of my favorite parts of the quilting process. I ended up between these two groups, but I only had a fat quarter of the red fabric on the left and it wasn’t enough. I’m glad I took the time to figure that out before cutting. Diane doesn’t give fabric amounts in the instructions. I followed her instructions of cutting the triangles because I have a half square triangle ruler where you cut strips of fabric, then cut the triangles. (She does give instructions for making the HST units with using the two from a square method, too). I knew that if I did it this way, I would have to be very accurate with my cutting and sewing. I use a weight on the end of my long ruler to hold it in place while cutting strips, but not usually on smaller rulers. I did use it to hold the triangle ruler in place so it didn’t slip and felt like I got nice accurate cuts. I had very little trimming to do, just cleaning up the edges a bit. I haven’t sewn the rows together yet, but you can see what the corner is going to look like. The blue on the outside will be the sashing for this step. I really like how this quilt is coming together so far. I do think I will be changing up Step 4 for next month, though. I’ll finish up Step 3 so I can take it for show and tell at our guild meeting next week. 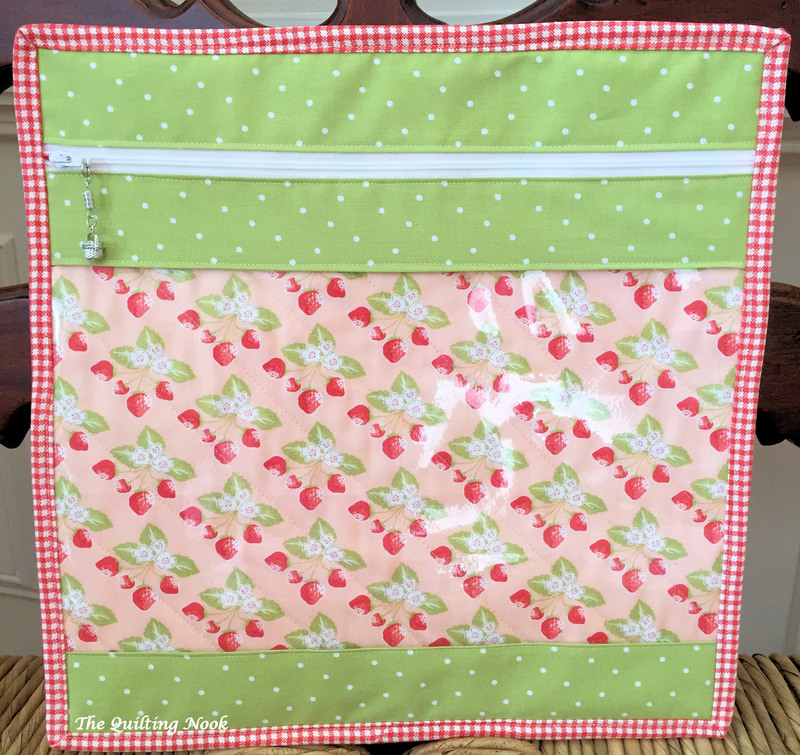 Last weekend, I made two project bags to hold cross-stitch or embroidery projects. The red and aqua fabric is Holly’s Tree Farm by Sweetwater for Moda. I’m not sure what the plaid fabric is, I’ve had it a long time, but the accent fabric is from one of Holly Taylor’s collections. Do you see the little patch on the tree farm bag? I was trying to press the zipper a little on the front and accidently touched the vinyl. Don’t do that, you end up with a hole! Fortunately, I was able to patch it. This week I started Jack Frost’s Tree Farm by Little House Needleworks. I thought Jack’s Tree Farm and Holly’s would be a good match! This is going to be fun to stitch! I switched out the called for fabric for a 32 ct. Lambswool linen and thought I was going to use all the called for colors. When I started using the called for Classic Colorworks Eggshell for the snow, it blended in completely with the background so I took out the few stitches that I had made. I’ll have to see what I have in my DMC threads or maybe even an Aurifloss. Since I couldn’t continue with Jack’s Tree Farm, I pulled out the Farmhouse Christmas, also by Little House Needlworks and started the center square. But after starting the corner border in that one, I’m not happy with the green. Even in the block I’ve already stitched, I think the green is too light so I may take that out as well. I hope to at least get some new colors picked out today, then decide which one I’ll continue to stitch on. My plan was to fill up my small hoop on Jack’s then move on to another project. My daughter is home for spring break so I don’t know how much sewing I’ll get done this week. Our plans have gone from spending a few days in Boone, NC to a few days in Helen, GA, now to maybe a day in Dahlonega, GA with some shopping trips on other days. We’ll see what the week brings. At least after today, the weather is supposed to be warm, if not very sunny. Hello Everyone! Today is a special Minis and More Parade day hosted by Sherri and Michele. It’s a Pin Pal Parade or Pinny Parade or Pincushion Parade. Whatever you want to call them, they have been fun to make. I didn’t really color plan the group, but they all look nice together. The Pin Pals finish around 4 1/2″ to 5″ and the blocks are slightly smaller, just so you know! I started with the book “Pin Pals” by Carrie Nelson. Then I added two more, just for fun. Lets get started with my parade because each one has a story. I’ve always wanted to make a Bear Paw quilt and this is the closest I’ve come so far. The fabrics are scraps from the upcoming Cabin Collection for The Art of Home Club. I needed to make this one first because I sent the quilt to Jacquelynne Steves on Monday. There are parts of a Bear Paw block in this quilt with a bear and maybe a moose or two. I love this quilt, but I can’t show it until the 20th of April. The fabrics are Christmas Red Bella Solid, White Paper Moda Grunge and Fun by Timeless Treasures. I’m really glad Carrie included “Old Glory” in the book. It was easy to make and it looks awesome in Bonnie and Camille scraps, which I have lots of. My tip for working with lots of seams is to use “Flatter”. It’s like a starch or Best Press, but different. I don’t use it to pre-starch my fabrics, but when there are a lot of seams in a block, it helps get them pressed down nice and flat. And Old Glory has lots of seams, although I took Carrie’s suggestion of trimming them to 1/8″ and that helped reduce the bulk. I love the backing fabric from Bonnie and Camille that I used on Old Glory. Carrie called for using batting and quilting the backs, too. I did that on the Bear Paw, then decided I would rather have a smooth back. Instead of batting, I fused Pellon SF101 Shape-Flex woven interfacing to the backs. Having the thinner back also made the Pin Pals turn easier. Next up is Ohio Star-ish. This was fast and easy because I already had the quarter square triangles from the Linked Mini. All I had to do was trim them to 1 3/4″ and add the corner squares and the top was done! The Linked Mini is from a pattern by Sherri that was in the Summer 2016 Quilts and More magazine. You can read why I had lots of leftovers if you want to. The fabrics are all from past Nancy Halvorsen’s Christmas Lines, which I love. The Farmer’s Wife Pin Pal was another quick one to make. I used leftover charm square strips and squares from Lella Boutique’s Garden Variety fabric and another White Grunge. The scraps came from the Round and Round (by Camille Roskelley) table runner I’m making with the charm pack that came in a Sew Sampler Box. I started this at the beginning of January, but this is as far as I’ve gotten. I plan on working on it this weekend. Okay, if you’ve been following me, you know I’m slowly making 16″ Swoon blocks for a Swoon 16 quilt (pattern by Camille Roskelley). I have 5 more of those blocks to go. When I saw the Swoon block in Carrie’s book I knew that too, had to be made. There’s 69 pieces of fabric in the block! I used scraps from making the big swoon block and was scrambling to find enough of the red and outside green points. I used HST trimmings to cut some of the red squares. Again, Flatter was my friend when pressing the finished block. I chose these fabrics because this is one of my favorite swoon blocks. I used up all my Day Sail red fabric though to make this one. All fabrics are Bonnie and Camille with the White Paper Grunge. Just one more picture because I love it! Maybe, after the next 5 swoon blocks are made, I can make a little Mini Me quilt from the scraps. Last, but not least is the “Winter in Baltimore” cross-stitch Pinny, pattern by Brenda Gervais. I love this little cross-stitch piece. It was my first experience working with 1 thread over 1 square (most are worked with 2 threads over 2 squares). I see more of this 1 over 1 in my future. The fabric is a 28 ct Lugana in either white or mushroom. The cross-stitch is just slightly under 2″ square. The fabrics are perfect with it. The pink is by Edyta Sitar of Laundry Basket Quilts and the aqua is from Porcelain by 3 Sisters. If you haven’t made your own pinny, grab some scraps and start sewing! I hope you enjoyed my parade. Be sure to check out the rest of the parade with Sherri and Michele. Thanks for stopping by! Hello Everyone! I know it’s been almost two weeks since my last post, but I have been busy working on the Cabin Collection for Jacquelynne Steves. I finished all the projects and sent them off on Monday. Yea! I have been working on the pattern instructions and will finish those in another day, but I thought I would take a few minutes to share the few other things I’ve been working on. I finished Step 1 and 2 of Diane Knots Sew Your Stash Along. This is a free SAL on her website. I chose to use some red, blues, and whites that I’ve been collecting. The SAL is a special project my guild is participating in. It’s always fun to see the different interpretations of everyone. I finally started on the Minis and More project for this month, pin cushions. I made four from this book “Pin Pals” by Carry Nelson. Some are traditional patchwork blocks, others made with strips of fabric scraps. It’s a good book with lots of tips for working with small pieces. Most are under 5″. These are three of them before they were quilted and stuffed. If you follow me on Instagram, @thequiltingnook, you’ve already seen a few of them. Friday will be the Minis and More Parade day and I will have a post dedicated to the Pin Pals. Each is associated with a quilt so be sure to check back Friday afternoon. I’ve also been working on some x-stitch. I’ve finished stitching Winter in Baltimore by Brenda Gervais and it will be featured with the pin pals. I also spent and evening working on the Gingerbread House by Country Cottage Needleworks. I spent the afternoon binding the cabin quilt with dark binding on black backing and my eyes needed a break from the 1 over 1 stitching of Winter in Baltimore. I just have a little left and this one will be finished. That’s it for now, I need to get back to my patterns. Thanks for stopping by. Hello Everyone! Has anyone else discovered the Flosstube craze? When I first saw the term on a Fat Quarter Shop video title, I didn’t know what it meant except Kimberly was talking about Cross Stitch in the video. I was finally curious enough to go to YouTube and check it out. There are thousands of Flosstube videos out there! So I started watching. And I got hooked. I’ve made a few small cross stitch pieces over the last five years or so, but nothing big. I was doing more embroidery or knitting in my evening hours. I thought I would make something again so I started working on a few Christmas ornaments. The Stag piece above is the only one that I finished, but working on it made me realize how much I still enjoyed cross stitching. The problem, my eyes. I think that’s why I stopped before, it was just getting too hard to see. But there are solutions to that and I think I’ve found one that works for me. My mother-in-law gave me all her cross stitch things a long time ago and I remembered there was a magnifier with them. It goes around your neck and works well for me. I don’t even get laughed at by my family. I showed you a little progress on Farmhouse Christmas by Littlehouse Needleworks before. I’ve finished Block 9 and will start another block in March. My goal is to finish one a month. That gives me time to work on other things. I wanted to use the green floss that was called for in Farmhouse Christmas, so I was looking on line for it and found a Super Bowl Sale at Stoney Creek. I ended up picking up these Prairie Schooler charts and two pieces of fabric. The Happy Christmas has just been reprinted and I saw several “Flosstubers” working on it. You do see that it’s worked on black. I don’t usually work with Aida cloth but I heard someone mention that working with 18ct black Aida was a lot easier then linen. So I got some of that too. I got the Country French Linen 32ct Rain (green) and Black Aida from Stoney Creek and the Winter Sky 32ct Line from 123Stitch. I also picked up the Drawn Thread chart Welcome Summer from 123Stitch, along with some hand dyed floss. The Halloween, Christmas and Winter Welcome came from my local quilt shop Tiny Stitches, which has a nice section of cross stitch and embroidery items. The called for floss for these are all silk, so I will be substituting some of the hand dyed cotton and DMC for them. I’ve kitted up the Summer Welcome and will start on that one shortly. I also saw a Fall Welcome that I might like too have, too. There are a lot of cute charts out there, so much more than when I was serious about cross stitch in the ’90s and early 2000’s. As quilter’s, we usually have a few projects going on at the same time, but some of these flosstubers have over a hundred WIPs. I don’t want to get caught up in that. I have about 10 charts now to work with for the rest of the year, I think that will do. I did get this Brenda Gervais chart recently at Tiny Stitches. It’s worked one thread over one square on 28ct evenweave. If you’ve never done cross stitch, most pieces use two strands of floss over two linen squares or on Aida, two threads over one square. This is tiny, but I was surprised that it’s not too hard to see. I think it’s because its an evenweave and white. I am using the called for flosses, all hand dyed. You can see the holes in this picture and how tiny this is going to be. The design size is 2″ x 2″. I’m making the pin cushion first, but I would like to make the bigger piece and put it on the shaker box as shown on the cover. You can also see a stitching mistake in the picture that I couldn’t see just looking at it. That’s near the beginning of a thread start so I hope I don’t have to take too much out. But now that I know it’s there, it will bother me and will have to be fixed. Some of them also quilt, especially Pumpkin Hollow Quilts. I have been following her on IG for a while. She just started her Flosstube Channel and she shows her quilts, too. It would be fun if quilter’s started showing there quilts like the Flosstubers show their things. We all like show-n-tell. Pat Sloan has started a Fireside Chat video series which is similar to the Flosstube videos. Next week I hope to get back to some new and old quilty things. I have been quilting the Cabin Collection this week and hope to finish the big quilt this weekend. I hope you all have a very pleasant weekend and thanks for stopping by!